Shoulder N/A 12.5" 13" 13" 14.5"
Bust N/A 35" 35.5" 37.5" 39.5"
Waist N/A 29.5" 30" 31" 33.5"
Length N/A 56" 56.5" 57" 57.5"
This is a beautiful women’s maxi dress that is perfect for so many occasions! 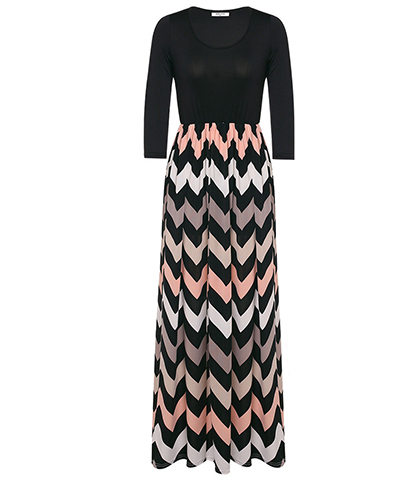 The floor length skirt portion of the dress comes in a large, multicolored herringbone print in black, white, taupe, salmon and tan. The bodice is presented in solid black. This dress has a rounded neckline and snug, three quarter length sleeves. It has no zippers or buttons and slips easily over the head. The skirt portion of the dress has a slight amount of fullness for beauty and comfort. This dress is machine washable and may be tumbled dry on a low heat setting. It is available for purchase in sizes Small, Medium, Large, Extra Large and Extra-Extra Large.